Successfully Added Thrifty Watch Phone (Quad Band, Bluetooth, Touchscreen) to your Shopping Cart. 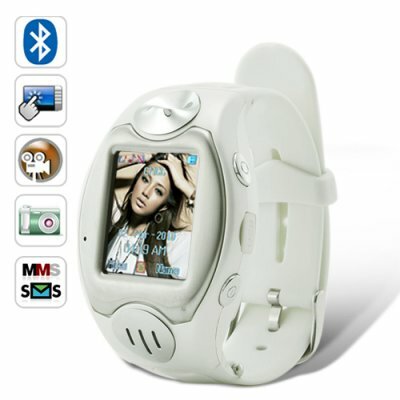 This thrifty watch phone is a quad band GSM (850MHz, 900MHz, 1800MHz, 1900MHz) unlocked phone that can be used from anywhere across the world. Stick in a SIM card and you gain instant access to an amazing communication device that works like a cell phone on your wrist. This thrifty watch phone also includes a clear and accurate 1.3 inch touch screen LCD display that allows for easy menu navigation and quick dialing without even having to use the included stylus, just use your fingers! No longer do you need to keep your phone in your trouser pockets where the screen gets scratched up by your keys. No longer will you need to hold onto the phone and not have the use of both hands. This watch phone is both practical and perfect! I live in India, can I buy this thrifty watch phone? Yes, you can buy and use this watch phone in India. In fact, you can use it from almost anywhere in the world! Why is this thrifty watch phone so affordable? I wanted a phone just to keep in contact with one person (I have an Android phone for everyone else) and this is great. I prefer to use a bluetooth headset that I already had, although I have ordered the mini bluetooth so I can wear it at work. This phone does what I want with the benefit of being cheap, so if anything does happen to it, replacement isn't going to be a bank breaker. Other people may want all the features, which the phone has, but I wanted a simple phone, and this serves the need. I just recieved this product and it does exactly what was said about it. It would have been better with other colour types. The bluetooth device didn't work perfectly and couldn't be charged. I love this product but wish the bluetooth was working fine. the touchscreen is really reponsive and easy to use i really like it thanks chinavasion you are the best and always! on 2010-10-22 21:08:32 Very Nice! This watch is awesome! My customers have been amazed with the watch features and style! A watch phone? Be for real, they say! I am about to order a few more for sell! I love the attention the watch gets and I am the only retailer in my city that sells them! on 2010-09-14 00:57:02 Nice Device..